Wind refers to any flow of air above Earth's surface in a roughly horizontal direction. A wind is always named according to the direction from which it blows. For example, a wind blowing from west to east is a west wind. The ultimate cause of Earth's winds is solar energy. When sunlight strikes Earth's surface, it heats that surface differently. Newly turned soil, for example, absorbs more heat than does snow. Uneven heating of Earth's surface, in turn, causes differences in air pressure at various locations. Heated air rises, creating an area of low pressure beneath. Cooler air descends, creating an area of high pressure. Since the atmosphere constantly seeks to restore balance, air from areas of high pressure always flow into adjacent areas of low pressure. This flow of air is wind. The difference in air pressure between two adjacent air masses over a horizontal distance is called the pressure gradient force. The greater the difference in pressure, the greater the force and the stronger the wind. An important factor affecting the direction in which winds actually blow is the Coriolis effect, named for French mathematician Gaspard-Gustave de Coriolis (1792–1843). In 1835, Coriolis discovered that a force appears to be operating on any moving object situated on a rotating body, such as a stream of air traveling on the surface of a rotating planet. Because of the spinning of Earth, any moving object above the planet's surface tends to drift sideways from its course of motion. Thus winds are deflected from their straightforward direction. In the Northern Hemisphere, the Coriolis effect tends to drive winds to the right. In the Southern Hemisphere, it tends to drive winds to the left. Coriolis effect: A force exemplified by a moving object appearing to travel in a curved path over the surface of a spinning body. Local winds: Small-scale winds that result from differences in temperature and pressure in localized areas. Pressure gradient force: Difference in air pressure between two adjacent air masses over a horizontal distance. The Coriolis effect and pressure gradient forces are the only factors affecting the movement of winds in the upper atmosphere. Such is not the case near ground level, however. An additional factor affecting air movements near Earth's surface is friction. As winds pass over the surface, they encounter surface irregularities (hills, mountains, etc.) and slow down. The decrease in wind speed means that the Coriolis effect acting on the winds also decreases. Since the pressure gradient force remains constant, the wind direction is driven more strongly toward the lower air pressure, often resulting in gusts. Local winds are small-scale winds that result from differences in temperature and pressure in localized areas. Sea and land breezes are typical of such winds. 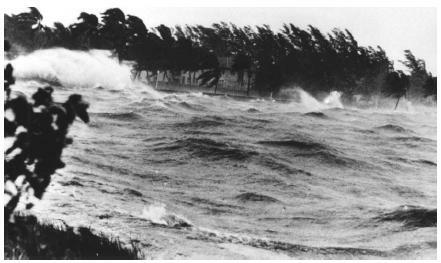 Along coastal areas, winds tend to blow onshore during the day and offshore during the evening. This is because dry land heats up and cools down quicker than water. During the day, air over land heats up and rises. Cooler air over the water then moves onshore (sea breeze). At night, air over the water remains warm and rises. The nowcooler air over land is then pushed out to sea (land breeze). The presence of mountains and valleys also produces specialized types of local winds. For example, Southern Californians are familiar with the warm, dry Santa Ana winds that regularly sweep down out of the San Gabriel and San Bernadino Mountains, through the San Fernando Valley, and into the Los Angeles Basin. As the air blows over the mountains and sinks down into the valleys, it creates high pressure. The high pressure, in turn, compresses the air and heats it. These warm winds often contribute to widespread and devastating wildfires. quite different from the temperature measured in the same location with a thermometer. In still air, skin is normally covered with a thin layer of warm molecules that insulates the body, keeping it slightly warmer than the air around it. When the wind begins to blow, that layer of molecules is swept away, and body heat is lost to the surrounding atmosphere. An individual begins to feel colder than would be expected from the actual thermometer reading at the same location. The faster the wind blows, the more rapidly heat is lost and the colder the temperature appears to be. The National Weather Service has published a wind chill chart that shows the relationship among actual temperature, wind speed, and wind chill factor. Wind chill factor is the temperature felt by a person at the given wind speed. According to this chart, individuals do not sense any change in temperature with wind speeds of 4 miles (6 kilometers) per hour or less. The colder the temperature, the more strongly the wind chill factor is felt. When the wind chill factor is below −58°F (−50°C), flesh will freeze in about one minute. Wind shear occurs between two air currents in the atmosphere that are traveling at different speeds or in different directions. The friction that occurs at the boundary of these two currents is an indication of wind shear. Wind shear is a crucial factor in the development of other atmospheric phenomena. For example, as the difference between adjacent wind currents increases, the wind shear also increases. At some point, the boundary between currents may break apart and form eddies (circular currents) that can develop into clear air turbulence or, in more drastic circumstances, tornadoes and other violent storms. Under certain storm conditions, a wind shear will travel in a vertical direction. The phenomenon is known as a microburst, a strong downdraft or air which, when it reaches the ground, continues to spread out horizontally. An airplane that attempts to fly through a microburst feels, in rapid succession, an additional lift from headwinds and then a sudden loss of lift from tailwinds. In such a case, a pilot may not be able to maintain control of the aircraft in time to prevent a crash. the article is very good. you make an addition of diagramatic representations of the issues you send to us through website so that we get enriched with your best materials that will cope with university level of study we are pursuing at the moment. COMMENT FROM, MUSLIM UNIVERSITY OF MOROGORO, TANZANIA. this article is very good!! it really helps me in doing my report. my work got easier.... THANX!!!!!! I want to learn more about the effect of temperature and pressure on the change of wind speed and direction. Thanks to weather monitering service this is a brief notes on the wind direction.it is very good short note. My understanding would have still been in jeopardy if not for this article. Its making studies in the university great. a very nice amount of notes you have here... wish there was more to read, but either way, it was great. thank you. Question? How the distance from the sea can affect the horizontal pressure differences? I'll be checking this site for other articles. Great and clear explanation. I have been wondering about the effects of weather on humans. The twisting effect in high pressure is opposite in low pressure conditions. The tops of dominant White Pine lean to the SE. When splitting wood most tree trunks are twisty. The opposite twist of low pressure conditions, added 10 lbs./ gallon water content, in the air, and the decreased muscle tone, of the elderly, surely adds stress to the body that may not be felt by youthful individuals. When diving every 33 ft. adds one atmosphere of pressure. Clouds carry a lot of moisture and bears down on the body. Worn joints are accustomed to westerly air movement but not the spinning vortex's given off in low pressure conditions. This almost certainly explains why the elderly are such great predictors of the weather. How does humans or human activity affect winds? Thought you might need to add that in your next articles.